The Nokia S40 OS has a large amount of user base but was missing a dedicated full feature Twitter app for users to access Twitter. But not anymore, as Twitter and Nokia have come together and release the ‘Twitter for Nokia’ app for all S40 running featurephones. The Twitter for Nokia app for S40 devices which would let all the S40 users use the official Twitter for Nokia app to have access to the world of Twitter. It is a great move from Nokia and Twitter as this would allow millions and the next billion users on the S40 platform to not feel left alone without a Twitter app. 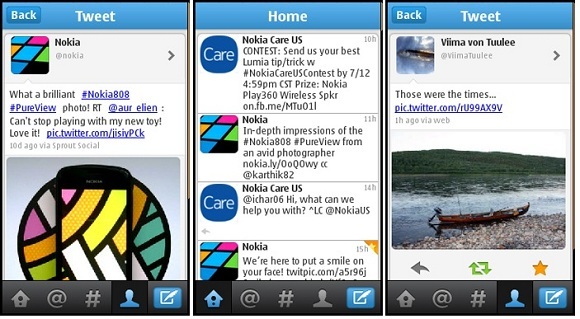 With Twitter for Nokia you can post your own Tweets and follow others’ Tweets. There’s also the @Connect feature to see your mentions and new followers and you can browse the most interesting Tweets from around the world using the #Discover feature. Nokia has said that all is future built Series 40 phones will have the app pre-installed which is again great news. And for now if you own an S40 phone then you can download the Twitter for Nokia app from the Nokia Store from the widget below.